So this is my review of Virpus VPS Hosting, as a principle i only review hosting companies AFTER i've been with them, as well as i try and be to the point with my review and it shouldn't be taken as a literal performance of the hosting company as a whole, just of my particular experience. I was with Virpus for 5 months, and i signed with their unmanaged Advance package (so a mid to high end hosting package) with Directadmin, since the initial payment it took around 9 days to setup my account but after a contact with support they did apologized, they said that they had a huge surge of new customers and were a bit late on the setup as well as i was discounted for those days, so thats cool. After the initial setup there were a couple of things that weren't setup right, especially since there were extra notes fields when you first signed up to put that kind of added or just needed information for a correct setup, but those seemed to be ignored (not a huge deal, since a lot of vps companies do this, probably cause the people that make the setup don't do any tinkering), so a few back and forth with support and everything is on track. So the hosting comes with Directadmin hosting control panel, well its kinda a subpar hosting panel, but at least it has a low overhead (doesn't consume a lot of resources), that and probably a new server (although with not so new hardware) meant performance wise, the vps was quick and the first site i transferred over was indeed almost 2 seconds faster than on the other vps it was on. After about a month later i transferred another site over, still the performance of both sites was pretty good, this lasted for 2 and a half months, since then i started having some downtime, for some apparently unknown reasons, others were to DDOS or Server Problems, so i had about 5 fairly large periods of downtime in the first 4 months, however in the last month i started having daily mini periods of downtime, i know i know, it can be a problem on my vps, but the vps was stable and apache has like 20 days of uptime i was using barely half the resources on the vps as well as the downtime was at random times, but still the sites started to drop off the internet for 5 or 10 minutes at a time (i use 3 different site monitoring services), i contacted support and nothing but excuses but nothing is done, so i moved one of my sites back to another vps, but the downtime continued for 2 more weeks, then again i contacted support and i was said they were going to scale this to management, i waited one more week and since i wasnt contaced by support or management and the trouble ticket in question was closed, i moved the last site to another new vps. So i would say that i would recommend virpus to anyone that wanted a cheap vps for hosting anything that wasn't priority (hosting files, cache, image galleries, backups), it was quick and overall the downtime wasn't that bad (a month with about 20 downtime windows of about 5 to 15minutes each is bad for a active site, but not that terrible for file hosting or something like that, its still about 90% uptime), but i can't recommend them cause they did try and charge my credit card when they didn't have any reason to do it (for some companies you do have to pay something before you leave), so if you read this, there are way better and cheaper hosting companies on the web, so stay away from virpus. Update: So a week as gone by and im still getting the "Invoice is Due" and that i should log in to my account and pay, nice ^_^ but since they closed my server and then closed my account, so even if i wanted to pay i was out, a little more of this and ill just consider it spam/phishing and start flagging them all as such. its a great review.VPS Hosting is one of the fastest growing hosting niches.And Windows VPS Hosting plans have significantly increased. We have used Virpus networks for more than a year and they are nothing short of terrible. 1. They have had numerous VPS outages where the entire VPS gets accidentally deleted. They do not restore these and then they do not provide a credit for them either. 2. If you prepay your account balance they say that they will not refund any prepayment or overpayment because "all payments are our intellectual property" once you send the money to them (craziest statement I've ever seen). 3. They fail to read support tickets fully or reply to them in a timely manner (often days at a time). 4. Their CEO is Kenneth Odem and he has had troubles in the past with companies he has operated apparently in terms of downtime and support and is doing nothing with VIRPUS that should give anyone any confidence that its gotten better. This is a terrible company. 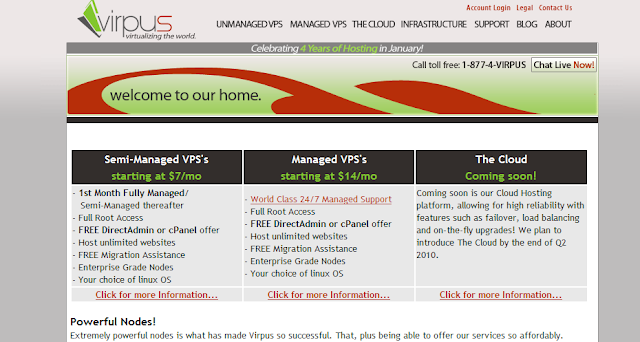 If you are thinking of purchasing a VPS or cheap server do not use Virpus Networks as they are nothing but trouble. After more than 1 year with them we can say this impartially. Yeah both times i was with virpus it was a big mistake, they get a lot of business cause they undercut everyone on price, but then they never deliver on the service... so yeah no point in using them!